The type and layout of the top chord steelbrace relate to the span, shape and loading of the roof. The angle from steelbrace to wall frame shall be between 30° and 45°. Bracing bays shall extend from the end trusses of the roof, unless otherwise specified in this Standard. The area of the standard overhangs is not required to be braced. 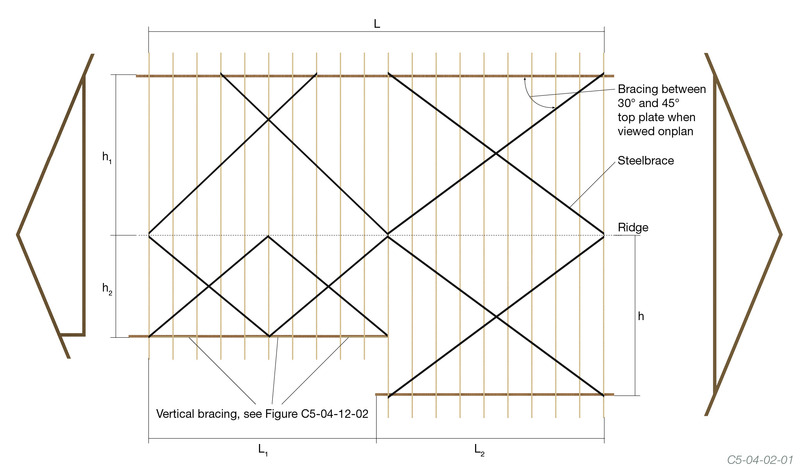 Length (L) - the length of run of similar trusses with similar support positions. However, where adjoining sections of the roof have trusses running parallel to the trusses in the section being considered and where the top chords are in the same plane, Length (L) may be extended into the adjoining section, provided that the trusses have common support positions (see Figure C5-04-02-01). The horizontal distance from the pitching point to the point at which the top pitch changes.